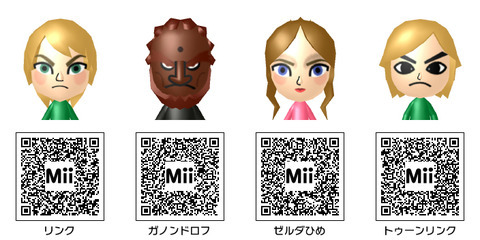 These Mii’s recently found on Naver.jp, by forum user Lanzz, are Mii’s that were created for the 3DS. These Mii’s can be used just like a Mii you create on the 3DS or Wii, but instead of going through the whole creation process, you can simply scan the QR codes that are underneath each picture above. You can also transfer these Mii’s in image format on an SD card on which the Nintendo 3DS will store various data and games. On the left, is Link, then we have Ganondorf, then Zelda, and lastly, the fellow on the right with the exaggerated features is Toon Link. Do you plan on using these Mii’s? or at least downloading them? The website that theses were found on, Naver, has lots of other Mii’s that you can check out and download, here. I could only recognize a few of the other Mii’s that were created including Mario, Luigi and Wario, and also the Powerpuff Girls. Let us know which one’s you recognize.